This article was written by CBSNews.com intern Peter W. Stevenson. More and more Americans are applying to join the Peace Corps, even in a post-9/11 environment in which personal safety and anti-American sentiment are important concerns. Volunteers say they relish the chance to do something positive for some of the world's poorest countries and help the United States' image abroad. "The need for the Peace Corps in the world today is as strong as it's ever been — the need for understanding that the Peace Corps presents, there's a stronger need than ever," said Sarah Allen, a recent volunteer who now works at the Peace Corps headquarters in Washington. "I think people realized that after September 11, and that might have motivated more people to apply." In 2005, the Peace Corps accepted 4,055 volunteers into the program, joining an organization that now has to turn away almost two-thirds of its applicants. Applications have risen more than 20 percent since 2000 — testimony to a successful government push for increased volunteerism in the United States, according to Peace Corps Press Director Barbara Daly. In a February 2002 speech, President Bush said he wanted to double the number of Peace Corps volunteers within five years. Reaching that goal seems unlikely: The total number of volunteers rose from 6,630 in 2001 to 7,810 at the end of 2005, an increase of almost 18 percent. 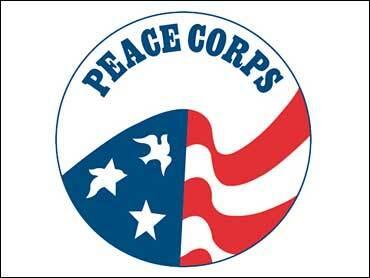 But Daly said the Peace Corps is achieving its immediate goal of expanding existing programs and starting new ones. The newest program will be in Cambodia, where the Peace Corps has never had volunteers. Daly cited several reasons for the huge increase in applications. "We've definitely been recruiting aggressively," she said, noting that the organization has expanded its recruiting efforts to minority-based colleges and universities as well as retired teachers' organizations. But the biggest single factor in the expansion has been funding, she said. "Every year since 2002, our funding levels have been higher than they have ever been," Daly said. "That's not something that has historically happened with the Peace Corps as consistently as this." When President John F. Kennedy established the Peace Corps in 1961, few thought college-aged volunteers could make a real impact. But by 1966 the organization had more than 15,000 volunteers — the most in its history. Volunteering has also become a very attractive option for college graduates, according to volunteers. "I know there's this kind of 'go to college, go to grad school then get a job,' (mentality), " Allen said. "But taking two years off — I'm so grateful that I spent two years in Haiti instead of two years in grad school." However, some things haven't changed from the '60s. The program can still present volunteers with difficulties and challenges that can be daunting. Peace Corps volunteer Shauna Rochelle West Goldberg felt out of place while walking through the outskirts of Lima, Peru. She was in a foreign land, and many of the comforts of home were far away. "That was when it hit me that things were going to be very different," she said eight months later. "I'll never forget that feeling." Ninety-six percent of volunteers have at least an undergraduate degree, according to the Peace Corps 2006 fact sheet. The average volunteer is 28 years old, but the majority are 25 or younger. The younger volunteers are offset in age by some of the oldest, including one who's 70. Allen and Goldberg agree that the Peace Corps attracts people who share a certain view of the world. "I think all Peace Corps volunteers are extremely idealistic, in the best sense of the word," Allen said. "They really believe that they can make an impact in these countries that need assistance." Allen added that many volunteers bring something back to the United States. They become so knowledgeable about their host countries that when their service is over, they can advocate for aid and support for those countries. Goldberg said she still keeps up with the other volunteers she met on her first day of orientation, and they all know they are doing something positive for the world. "We had this open conversation with the entire group — there were 32 of us," Goldberg said of her orientation. "It was probably the only time in my life that I have ever been in a room with such like-minded people."